Stem: 3--10 cm, branches spreading, fine-glandular, white-hairy below. Leaf: white-jointed-hairy; basal few, 4--8 mm, oblanceolate to obovate, entire or toothed; cauline 3--6 mm, spreading or recurved, lower entire or toothed, upper entire. Inflorescence: flowers 2 per stem; pedicels spreading, 4--8 mm, thread-like. Flower: calyx 2--4 mm, tube < 1 mm; corolla 4--7 mm, tube, throat yellow, included in calyx, lobes white, obovate, short-pointed; stamens attached near tube base, +- equal, exserted, style +- exserted. Fruit: 2--4 mm. Seed: 10--15 per chamber, generally not gelatinous when wet. Synonyms: Gilia inyoensis I.M. Johnst. 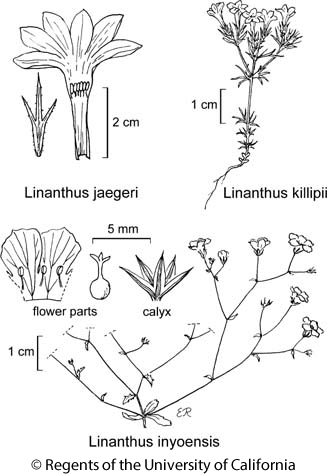 ; Gilia inyoensis var. breviuscula (Jeps.) Jeps. Citation for this treatment: Robert Patterson & J. Mark Porter 2015, Linanthus inyoensis, in Jepson Flora Project (eds.) Jepson eFlora, Revision 3, http://ucjeps.berkeley.edu/eflora/eflora_display.php?tid=80356, accessed on April 19, 2019.
s SNH, SNE; Markers link to CCH specimen records. Yellow markers indicate records that may provide evidence for eFlora range revision or may have georeferencing or identification issues. Purple markers indicate specimens collected from a garden, greenhouse, or other non-wild location.